Around September 1999, acting on a tip I received from a listserve of cartoonists, I purchased a Mustek A3 EP scanner, capable of scanning pieces as large as 11x17, for only $69 at a local electronics store chain—the perfect size for original comic-book art! I had it up and running in no time, connected to a desktop PC running Windows 98—a computer that’s still my primary PC. On April 24, 2008, the Mustek died after more than eight-and-a-half years of service. Of course Murphy’s Law was in full effect: it didn’t just die while I was working on a random page of my next issue, which would have been merely an inconvenience; instead, it died while I was in the middle of scanning the final-inked piece of my contribution for this year’s San Diego Comic-Con International souvenir program, the night before the deadline! Desperate to scan the piece, and with my wife and two children comfortably asleep in their beds, I drove down to my local 24-hours Kinko’s at 11:30 pm hoping they could scan it for me. Being the usual minimum-wage drones they are, of course they didn’t know how to scan the art as a high-quality tiff. (I suspect they could have, but they didn’t understand the full capabilities of the system.) Rather than attempt to take over the machine to figure it out myself, I decided to pack it in and hope to find an alternative the next day. I did and submitted the piece a few hours before midnight the day of the deadline. But, of course, I soon learned that the Comic-Con emailbox for accepting these submissions was full. Fortunately, I have a friend on staff at the Comic-Con who promised to forward the file to the right person. Despite the last minute panic, I hold no grudge against my old Mustek. It served me well over the years, and I was saddened to have to disconnect it from my computer and save it for the junk heap. 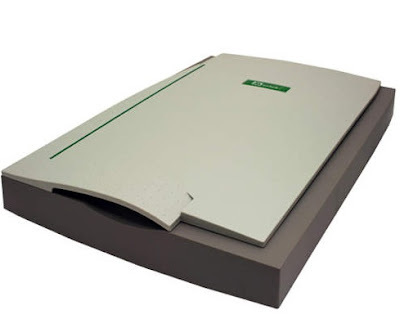 The Mustek is the only large-size scanner available at its price spectrum (under $200). Though I’ve read many complaints about its quality, it always served my needs and was a workhorse. I plan to get another Mustek to replace it, but it won't ever take the place of my original A3 EP in my heart! About a month ago, I finally began paying attention to my finances. Now that I have a family with children and assets (my wife and I became homeowners back in 2002, fortunately a few years before the housing market went bust), I realized we needed to think about our financial security. This always was on my radar. Years ago I purchased a Personal Finance for Dummies book to help me understand what I needed to do to procure a mortgage. And I actually read the business sections of magazines and newspapers regularly, a habit I picked up in grad school. Nevertheless, the world of high finance, investments, stocks, mutual funds, etc., always remained a bit of a shrouded mystery to me. However, driven initially by self interest, I embarked on a crash course in educating myself on the subject online (thank goodness for the websites like the Motley Fool), and began looking at my own financial picture. The result? In the span of about a week, I dumped most of my savings into higher-yielding online savings accounts (a small balance I knew I wouldn’t touch over the next year went into an online CD account with even higher interest); transferred my IRA funds into a brokerage investment account; met with a financial consultant who helped affirm that my new-found financial knowledge and sense was actually sound; opened a 401k and created an investment portfolio for it, and created an automatic savings plan to make sure I invest money into it each month; and did the same for my wife who coincidentally had just been promoted into a new position that allowed her to open a 401k plan with matching funds from her employer. And, of course—no doubt to the annoyance of my family and friends—I’ve begun dispensing financial advice to anyone who’ll listen. Many artists read this blog and there’s the old adage that artists have terrible financial sense. I don’t think that’s necessarily true, but I thought I’d mention this here as a reminder of how important it is to prepare for one’s future, especially since no one else will do it for you! Numerous reports have appeared recently that indicate that most people, particularly baby boomers, are at risk in their old age since they have not adequately prepared for their retirement. I attribute this partly to the surprisingly little formal financial education people receive in their youth. I’m kicking myself that I had not started this at least 10 years ago (even at that time I would have been starting late), but better late than never! I’ll just need to play catch up. Hopefully, this is something I’ll be able to impart to my children when they enter adulthood themselves. Surprisingly, after demystifying for myself to some degree the world of finance, I have found it to be quite exciting and fascinating. As a result, I’ve become quite the financial geek. 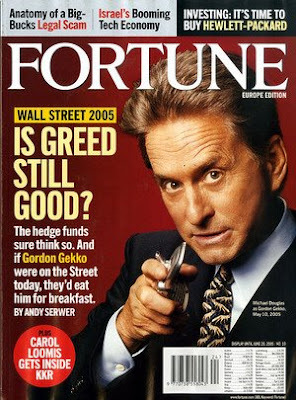 I read the business section with new understanding—though one has to be careful because as any financial expert will tell you, tracking the stock market on a daily basis and following its up and downs is a fool’s game since you are supposed to be in it for the long haul and keep your eye on the big picture. It’s also important not to get too caught up in chasing money for the money’s sake. What’s important is the peace and happiness that financial security will hopefully provide you in the future. If anyone wants some advice on starting out, feel free to contact me! 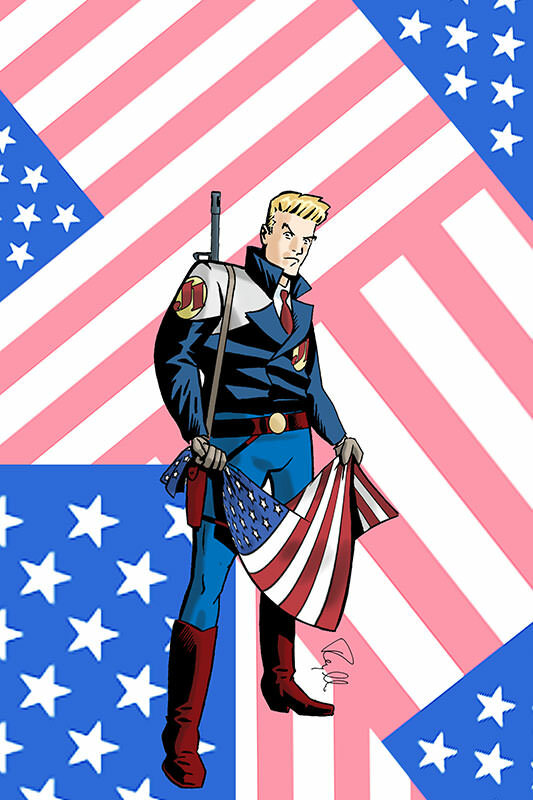 I’ve written numerous times about the many comics and cartoonists who inspired my work, such as Milton Caniff, Alex Toth, Roy Crane, and Will Eisner. However, there are also comics and creators more contemporary to me that influenced me deeply as well. I came of age during the 1970s after all, and it was while I was in college during the 1980s that the direct-market and alternative press began to flower. As such, in upcoming posts, I thought it would be fun to take a look back at many of the comics I grew up on, which no doubt played as important a role in informing my tastes as the classic adventure strips I primarily cite as my inspirations. 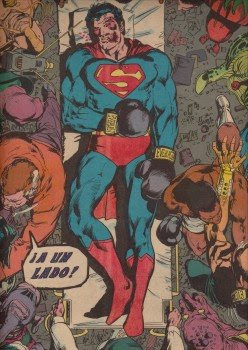 I thought it would be fun to begin with 1978's Superman versus Muhammad Ali oversize one-shot special from DC Comics. Though the original comic appears to be fairly easy to find at places like eBay, given that we’re in an age of classic comics being released again in prestige formats, it’s somewhat surprising to find that this story has not been reprinted since its original publication—or perhaps not given the licensing and permissions that no doubt would be required to reprint it: not only from Ali, but the literally hundreds of celebrity likenesses who appeared on the original cover of the comic-book among the spectators watching Superman and Ali going toe-to-toe in the boxing ring. At first glance, the comic-book seems to be the height of 1970s kitsch, another hokey cross-over sales gimmick. However, in execution, this comic-book not only successfully rises above the typical celebrity cross-over comic-book, but in my mind remains one of the best Superman stories ever that still stands as a template for everything a Superman adventure should be. It helps that the comic-book is written and drawn, respectively, by comics legends Denny O’Neil and Neal Adams. While the story is fun and occasionally winks at the audience, O’Neil and Adams otherwise treat both Ali and the character of Superman with great respect, and present an epic story where nothing less than the fate of the earth rests in both characters' hands. In the story, earth is invaded by a warrior alien race called the Scrubb that challenges Earth to select a champion to defend the honor and ultimate survival of the planet. (The Scrubb actually deem Earth to be an obstacle to their own secret designs to dominate the galaxy). 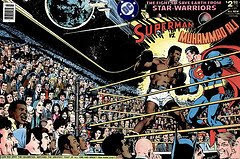 O’Neil and Adams cleverly find a way to create a level playing field in the boxing ring for Ali and the Man of Steel so that they may fight and decide who will represent Earth. The fight is thrillingly presented with great urgency and high stakes. Ultimately, of course, the fight between Ali and Superman turns out to be part of a larger scheme to save Earth and defeat the Scrubb. t’s an epic storyline told in a tight 72 pages, no doubt partly an attempt to capitalize on the Star Wars craze from the year before (the cover blurb proudly proclaims the comic to feature “The Fight to Save Earth from Star Warriors”). Regardless, the story is told winningly and manages to capture Ali’s braggadocio and outsized personality, while telling a Superman story that manages to be epic and, ultimately, emotionally involving as well. Adams’ photorealistic art, of course, and the oversize format helped sell the story, and it made quite an impact on my 16-year-old mind: I remember thinking that this is what Superman should be all about. While the story didn't break new ground and definitely was of its time, it's also told with style and enthusiasm—there is a joy and innocence to the proceedings that the field today certainly could use more of. I admit it, I enjoy doing my taxes. Of course it helps that I usually get a healthy refund due to itemized deductions. In addition, in my view, paying taxes is a basic civic duty. I must admit that in an era when people expect to have good schools, paved roads, and the resources to wage multi-theater wars—all while also demanding to pay no or less taxes—I figure that paying my rightful share of taxes is the least I can do for my country. In any case, as a comic-book publisher, cartoonist and small business, I do derive a sense of accomplishment from organizing my financial records, calculating inventory, computing my income and expenses for the year, cross-checking my figures, and having it all balance out. If nothing else, tax time forces me to take stock of how I did the previous year (which I reported about for 2007 here). Part of the fun is the software, which makes completing the forms and performing calculations easier and less labor-and-time intensive. In addition to using Quickbooks to track my business expenses (and Quicken for my business checking account), I rely greatly on tax preparation software. For many years, I used TaxCut to prepare my taxes—I received a sample CD of the software in the mail years ago and, as the company no doubt intended, I kept using it in subsequent years. Not just due to familiarity but because it carried over my personal information from year to year. This year, however, I migrated to a Web-based preparation service called TaxACT. While it's a bit easier to navigate to a precise taxline item in TaxCut, I like the fact that TaxACT is an online application, meaning you can access it from any computer with Web access (there also is an installable desktop version that you can download or order on CD). All the information and data you input is saved online, and the completed tax forms can be downloaded as a PDF onto your desktop for mailing in, or simply e-filed online. (For some reason, I am resistant to e-filing my taxes and still mail in my tax forms. I have found that I still get my tax refund fairly quickly, in just a few weeks.) I plan to fully migrate to TaxACT next year. After many years as a publisher/business owner, I now keep detailed notes and templates so that I don't have to reinvent the wheel each year, which has significantly reduced the time I need to spend preparing my taxes. This includes a spreadsheet I created that essentially mimics the Schedule C form for reporting business activity, which does all the math for me, including calculate my inventory. I also have created customized reports within QuickBooks that provide me with the correct figures I need that can be simply plugged into the required tax forms. Anyone needing assistance in preparing their taxes as a comic-book publisher would do well to pick up any tax guide like J.K. Lasser's Your Income Tax 2008. Before I began using the software, I used to purchase one of these tax guides about every other year—having such a book at the start gave me a good basic foundation in preparing my taxes, and continued to serve as a useful reference in subsequent years. These books early on gave me a solid, basic foundation in personal and small business tax law, but changes in tax law can now be easily found online or are usually conveniently written into tax preparation programs! Anyway, happy tax time to all!